Being Self-Taught, is that True? I’m currently taking an online class about… hmm.. I’m not really sure… How to build your career as an artist/illustrator/designer? And I wonder if I really needed that class at all. It’s a good resource to have but I’ve been thinking a lot about how a career is actually built. I also think about the concept of being self-taught. A lot of successful artists emphasize the fact that they are “self-taught”, but when I come to thing about it, nobody is self-taught. Even if you’re by yourself in your room watching YouTube tutorials or online classes, you’re being taught by someone. The only thing you do by yourself is EXPERIMENT. And, in my opinion you only begin to experiment after you’ve taken classes or followed many tutorials. The guy who said he didn’t have any passions showed us some of his pastel works which were awesome. He said he didn’t take classes from anyone, that he’d gone to the art supplies store, bought a bunch of materials and started producing. He even asked me why I bothered taking classes at all and I was mute. I looked at his paintings and though, why can’t I do that? Why can’t I just “express” myself? Why, in fact do I need classes? A few minutes later he mentioned a friend had gone with him to the art supplies store and sort of explained to him the basics of drawing with pastels. So, maybe he didn’t pay for classes, but someone taught him anyway. I take classes because if some people get a dopamine rush when jumping off a cliff tied to a rope, every time I learn something new I feel the same exhilaration, but mostly, I see classes as taking shortcuts. I could probably find my way into a decent body of work by trial-and-error but if someone can teach me a few tricks to understand value, hue and saturation, why not? It’s about how to produce more original work. It’s undeniable that the more you look at the work of your peers, the more you will create similar work. This episode begins with the idea of a fox illustration. How many fox illustrations will you find on Pinterest? To remedy this problem, I am working on the Skillshare Class Expressive Illustration, which basically is a different approach to the same concepts I learned in the Trends class by Design Garden and in the Lecture Lab: Through a lot of brain-work you need to arrive to original ideas by combining things that might not have anything to do with one another. I did four clip art sets during the Trends workshop and it was more work than I ever imagined. This is the only part you can teach yourself. THINKING, CONNECTING, INTERPRETING. But do you need classes for that? My new collaborator in my web services business has a bachelor’s degree in graphic design and illustration. She shared her sketchbook with me and she walked me through all the different tricks that her professors taught her during her four years in college: Mind maps, concept lists, layout techniques. So yes, I believe that you can be an accidental artist, but I also believe that learning from other people is so important. I’m becoming more and more convinced saying that one is self-taught is definitely inaccurate. Here’s a glimpse of my own art-education: those are piles of books by other people and piles of sketchbooks, and a bunch of brushes I’ve tested and three brushes that I found that I loooove, plus some watercolor meditational doodles. Do you think it’s fair to say someone is self-taught? Share your thoughts in the comments! How do you find the best Skillshare classes without getting lost? At first glance they all look super interesting and it is extremely easy to simply binge-watch class after class without actually practicing or doing the projects. So I will talk about the classes I did and for which I completed the assignments. This class was the first I took and it is a great introduction to how watercolor works. Even if you are not into fashion, Katie Rodgers does a great job at explaining things in a simple way. If you have a small watercolor set and you want to try your hand at it, this class will give you a great starting point. 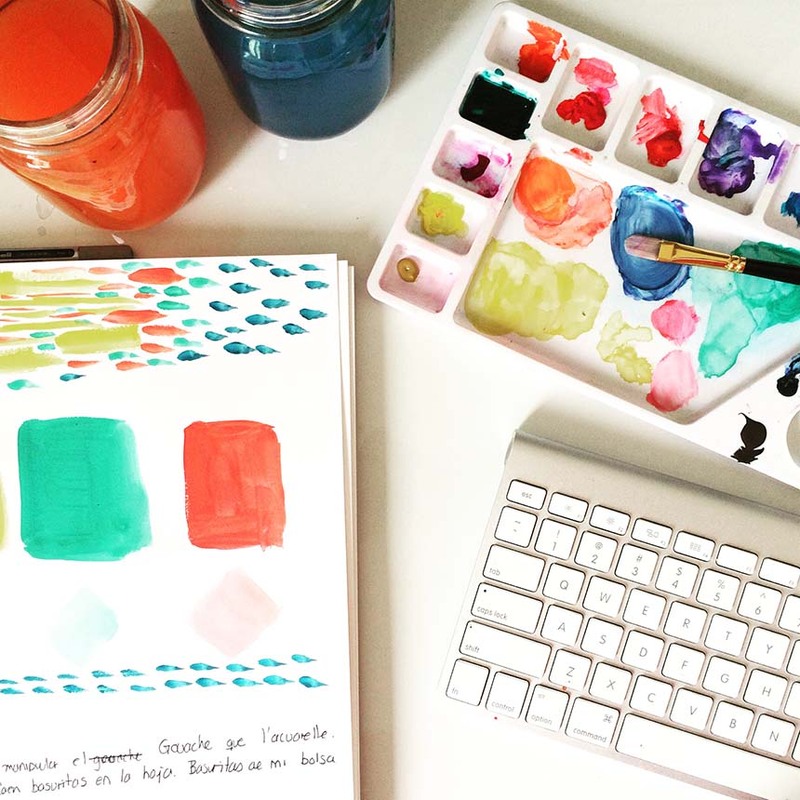 To continue with a bit more advanced watercolor, you can keep going with Katie Rodgers. This class teaches you to make a small fashion illustration. Going over the materials and a bit of drawing but the focus is on watercolor mixing. This is the most comprehensive class I’ve found. However it is calligraphy and not lettering. I know that I’m more interested in writing than in drawing letters so I found this class quite comprehensive. It delivers a lot of content (not like the latest classes that are less than 40 minutes long). However if you’re not a perfectionist (I’m not), you might find the digitizing process very long. But it’s an oldie and a goodie. I really liked this class because it teaches you how to create a pattern in Photoshop from your hand-drawn drawings. I love the manual labor of this style of pattern as opposed to working only in illustrator. I have done several patterns from hand and in photoshop and they turn out really lovely, they have an organic feel and painterly look. If you are a graphic designer you might find this class too basic though. If you’re interested in learning Illustrator, you will find a lot of Intro to Illustrator classes in Skillshare and other platforms but my approach in learning anything is looking for the class that teaches the closest thing to what I want to do. In this case I don’t necessarily want to do surface design by itself but I do want to be able to illustrate my hand drawn graphics. In this 3h and 43 min class you get both a crash-course in Illustrator and in hand-drawn graphics. If you want to learn illustrator the more traditional way, you might be better with The Ins and Outs of Illustrator. This class is just 15 minutes but it’s my favorite Skillshare class. The first time I watched I thought, what was that? but I watched it a second time and I did the assignment, I wound up with something so unexpected that now I use this exercise often. We usually forget how important a workflow is for coming up with ideas. I keep believing that these just come up as when you summon them. This class is very fast and you need to watch it twice. Do the assignment and you’ll be surprised. My dream is to learn bookbiding, however I’ve learned the hard way that each new hobby comes with a lot of expenses and bookbinding is an expensive hobby. Not only the paper is costly but you also need certain tools, and quite a bit of space. I was super happy to find this class because you can learn to make small notebooks out of any kind of paper. This is particularly useful because I can make sketchbooks. I must confess that I just tried part of the assignment because I don’t have the needle and thread but just learning how to cut and fold was super helpful. I’m bad at cutting a straight line and he gives a great tip to make sure you cut straight! So this is my round up of the most useful Skillshare classes I’ve taken. These are older classes where instructors delivered more and better quality content, however some do not have the best quality video. I don’t mind. I learned what I wanted. Lately 20 minute classes are not cutting it for me. They’re more like teaser classes so I’m not so enthusiastic about those. Do you have any favorite Skillshare (or other) classes?